Fusion bonded epoxy coating, also known as fusion bond epoxy powder coating and commonly referred to as FBE coating, is an epoxy based powder coating that is widely used to protect concrete reinforcement bars from corrosion. FBE coatings are thermoset polymer coatings. The most widely used types include acrylic, vinyl, epoxy, nylon, polyester, and urethane. Most popular for reinforcement bars is epoxy coating. The name fusion bond epoxy is due to resin cross linking and the application method, which is different from a conventional paint. FBE coatings are 100 % solid coatings applied as dry powders and formed into a film by heating. The fusion bonded epoxy coating process for reinforcement bars was developed in United States in 1960s and its use was strongly recommended in coastal areas. Since Its introduction, FBE coating formulations had gone through vast improvements and developments. Today, various types of FBE coatings, which are tailor made to meet various requirements are available. Modern application techniques for applying powders fall into four basic categories. These are (i) fluidized bed process, (ii) electrostatic bed process, (iii) electrostatic spray process, and (iv) plasma spray process. The electrostatic spray process is the most commonly used method of applying powders. In this process, the electrically conductive and grounded object is sprayed with charged, non conducting powder particles. The charged particles are attracted to the substrate and cling to it. The epoxy powder is applied by electrostatic spray on hot steel on preset temperature level. The powder, when in contact with hot bar, melts flows, gels, cures, cools and produces a well adhered continuous corrosion resistant protective coating. The thermosetting of the epoxy is an irreversible process and provides a good protection to reinforcement bars against corrosion. It prevents attack of chloride ion on the metallic surface and the occurrence of electro chemical reaction initiating corrosion of steel. The main components of a powder coating are (i) resin, (ii) hardener or curing agent, (iii) fillers and extenders, and (iv) colour pigments. The resin and hardener together is known as the ‘Binder’. The resin part is an ‘epoxy’ type resin. ‘Epoxy’ or ‘oxirane’ structure contains a three member cyclic ring (one oxygen atom connected to two carbon atoms) in the resin molecule. Most commonly used FBE resins are derivatives of bisphenol A and epichlorohydrin. However, other types of resins (e.g. bisphenol F type) are also commonly used in FBE formulations to achieve various properties, combinations or additions. Resins are also available in various molecular lengths, to provide unique properties to the final coating. The second most important part of FBE coatings is the curing agent or hardener. Curing agents react either with the epoxy ring or with the hydroxyl groups, along the epoxy molecular chain. Various types of curing agents, used in FBE manufacture, include dicyandiamide, aromatic amines, aliphatic diamines, etc. The selected curing agent determines the nature of the final FBE coating such as its cross linking density, chemical resistance, brittleness, flexibility etc. The ratio of epoxy resins and curing agents in a formulation is determined by their relative equivalent weights. In addition to these two major components, FBE coatings include fillers, pigments, extenders and various additives, to provide desired properties. These components control characteristics such as permeability, hardness, colour, thickness, gouge resistance etc. Degreasing – Reinforcement bars are first cleaned from surface contaminations such as oil and grease etc. by solvent cleaning or by burn off. Surface preparation – Reinforcement bars are blast cleaned using abrasive grit or by shot blasting to a white or near white metal finish. This cleans the steel of contaminants such as mill scale and rust. It also roughens the surface to give it a textured anchor profile. During this process, salt contamination is also removed. Heating – Reinforcement bars are heated to a temperature ranging from 200 deg C to 240 deg C using electrical induction heaters. However in some installations gas fired heating is also used. Powder application – The heated steel is passed through a powder spray booth where the dry epoxy powder is sprayed from a number of spray nozzles. As the powder leaves the spray gun, an electrical charge is imparted to the particles. These electrically charged particles are attracted to the grounded steel surface providing even coating coverage. When the dry powder hits the hot steel, it melts and flows into the anchor profile (i. e., the microscopic peaks and the valleys on the surface) and conforms to the ribs and deformations of the bar. It also bonds with the steel. The heat also initiates a chemical reaction that causes the powder molecules to form complex cross linked polymers which give the material its beneficial properties. Coating thickness in the range of 50 to 150 micrometers are usually obtained, even though lower or higher thickness ranges might be specified, depending on service conditions. Curing and cooling – The molten powder becomes a solid coating, when the ‘gel time’ is over, which usually occurs within few seconds after coating application. The resin part of coating undergoes cross linking, which is known as ‘curing’ under the hot condition. Complete curing is achieved either by the residual heat on the steel, or by the help of additional heating sources. Depending on the FBE coating system, full cure can be achieved in less than one minute to a few minutes in case of long cure FBE’s. During curing time the coating gets hardens to a solid. In some plants, the curing is often followed by an air or water quench that quickly reduces the bar temperature to facilitate testing and handling. Inspection and testing – FBE coated reinforcement bars are tested at the coating plant as per the requirements specified in the relevant standard (IS 13620 – 1993). On line and off line holiday checks and thickness checks are carried out. The adhesion of coated bars is also tested frequently by bending of the bar. Besides this, various other tests for every batch are done in laboratory such as chemical resistance, short spray, resistance in continuous boiling water, abrasion resistance and impact resistance etc. Handling, transportation and working – FBE reinforcement bars are to be handled with extreme care so that coating is not damaged during storage, transportation and handling/concreting. These reinforcement bars require padded contacts during transportation, stacking, handling till they are used in concrete. If the bars are to be exposed outdoors for more than 30 days, they should be covered with a suitable opaque material that minimizes condensation. The cut ends, welded spots and handling damages are required to be repaired with special liquid epoxy compatible with the coating. FBE coating on reinforcement bars has the following advantages. Since the coating is done on the coating lines, better quality control is achieved. The process gives uniform coating thickness. There is good bonding of coating with the steel as FBE has very good adhesive properties. Because of flexibility, the coating does not get damaged when the straight bar is bent during fabrication on a special mandrill. FBE coating acts as insulator for electro chemical cells and offer barrier protection to steel which prevents chloride ions through it. There are well established criteria for acceptance for FBE coating in different standards. FBE coated reinforcement bars provide the most effective corrosion protection to the reinforcement bars. FBE coating on reinforcement bars has the following disadvantages. There is reduction in the bond strength between coated rebars and concrete. As the technology is plant based, there is need for double handling and transportation of reinforcement bars. Handling of coated bars is to be done with utmost care to avoid damage to the coating. Performance of the FBE coated rebars is heavily dependent upon least defect in the coating. Patching in the defective area is not always effective. Even a small damage in the coating can initiate corrosion in severe environment, since the coating has no cathodic protection. Corrosion cells are set up in the damaged area of the reinforcement bars which leads to first de-lamination of the epoxy coating and then rusting. Being a barrier type coating, it facilitates localized pitting corrosion through pinholes. FBE coated reinforcement bars undergoes degradation on long term exposure to sunlight. FBE coated reinforcement bars shows generally poor alkali resistance. 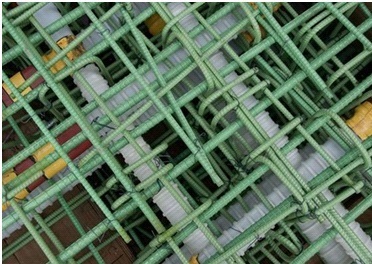 FBE coated reinforcement bars at a construction site are shown in Fig. 1.